Percentages in personal training can be absolutely invaluable. However, they need to be incorporated correctly in order to get the benefit out of them. One thing to think about, are percentages necessary for your clients? Nearly every strength and conditioning coach in the country relies on percentages to enforce desired intensities to athletes for certain lifts. Basically, the client would perform their lift at a percentage of their 1 repetition max. If they had a max bench press of 100lbs, and you wanted to do 3 sets of 12 reps at 60%, they would do 3×12 at 60lbs. This is absolutely necessary in most strength and conditioning environments for multiple reasons, including consistent program design as well as enforcement of intensity (speaking from experience, some people WILL slack if given the chance). So the question becomes, are percentages right for you? Well, let’s take a look at your situation. What level are your athletes or clients at? New athletes or clients probably would not benefit from percentages as much as more advanced clients, as they need to learn how to perform the lift correctly first and foremost. Second, a new client will adapt to the exercise so fast that by the next time you perform the exercise, their 1 rep max may be out of date and thus their percentages would be incorrect (if they used to bench 100lbs, but after 2 workouts they can bench 110lbs, that 60% you have them working out as now too low to cause the adaptation you are looking for). The next thing to look at, what are the goals of the client? 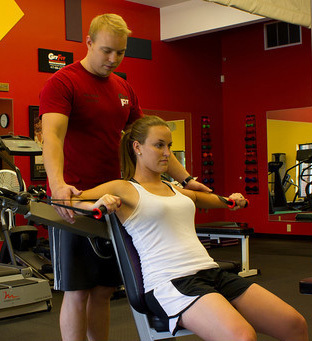 Many clients like personal trainers simply to help them work out, no specific goals but general overall fitness. For these clients, percentages are probably unnecessary as you as the trainer can monitor their intensity and effort by watching. If it is an athlete preparing for their sports, intensities will give you a great guideline to go by and allow you to accurately pick a weight for their work sets that will increase their potential for strength. Are you working with your clients in a group setting or one on one? Private training sessions will need percentages less than group, because as the trainer you can monitor intensity and adjust as necessary. In group settings, you may not be able to watch every set that every client does, so giving them weights to work at with each set is probably going to be more efficient. The question of whether you should use percentages with your training is a very individual one. Personally, I use percentages and weight calculation with nearly all of my athletes, however it is not a strict guideline. Sometimes the weight is too heavy, sometimes it is too light, and this is where the art of coaching comes in, to adjust as necessary. All of our personal training excel spreadsheets at Excel Training Designs can be modified to work with percentages, and you can step up your training today!